Gold stocks’ new bull market this year has already proven breathtaking. This obscure sector has nearly tripled within a matter of months, yielding immense profits for the smart contrarians who bought in low. But after such a blistering surge, what’s going to fuel gold stocks’ next upleg? Heavy gold investment buying driving its price much higher will greatly boost gold-mining profitability, attracting in far more capital. Gold stocks’ new bull run in recent months has been massive. Their leading benchmark HUI gold-stock index skyrocketed 182.2% higher in just 6.5 months between mid-January and early August! No other sector in all the markets is even remotely close to challenging this commanding performance. Yet this mighty gold-stock bull still remains young and small, with the great majority of its gains still left to come. Back in mid-January when all this began, the gold miners were universally hated. So their stocks were battered to fundamentally-absurd 13.5-year secular lows. They were trading as if gold had cratered to just $305 per ounce, but its actual price was 3.6x higher near $1087! So gold stocks were a screaming buy, as I argued aggressively the very week of those secular lows. This whole sector was radically undervalued. Since today’s bull launched from such extreme lows, it will almost certainly prove bigger and longer than normal. Mean reversions out of extremes usually overshoot proportionally towards the opposite extreme. And the standard for gold-stock bulls is already huge. The last one powered higher between November 2000 and September 2011, a 10.8-year secular span that saw the HUI rocket up a staggering 1664.4%! So nearly a triple in merely a half-year is nothing, practically baby steps in the context of gold-stock bull markets. While great gains have already been won by early contrarians, they are likely only the tip of the iceberg. Gold stocks remain quite low relative to today’s prevailing gold prices, let alone where gold is heading in its own new bull. Gold is naturally the overwhelmingly-dominant driver of gold-stock prices. Stock prices are ultimately driven by underlying corporate profits. And the gold miners’ earnings amplify changes in the gold price, exhibiting great profits leverage to the metal they mine. Higher gold prices lead to much-higher gold-mining profits, attracting more and more investors to this sector. These include professional fund managers controlling large pools of capital, and all this buying bids up gold-stock prices. Gold stocks’ next upleg is going to be fueled by a rising gold price, just like the last one and all before it. While gold investment demand has been very strong this year, overall portfolio exposure to gold remains really low. Several factors are converging which should greatly increase investors’ desire to diversify into gold in the coming months. Gold’s bullish outlook is easiest to understand through the lens of GLD. The SPDR Gold Shares are the world’s leading and dominant gold exchange-traded fund. Nearing its 12th birthday, GLD has become the gold investment vehicle of choice for large stock investors. It is an efficient and easy way to add portfolio gold exposure. GLD’s managers are very transparent, publishing a comprehensive detailed report to the individual gold-bar level every day on their gold held in trust for shareholders. GLD’s holdings are the best daily proxy available for whether investment capital is flowing into or out of gold. The mechanics of a tracking ETF like GLD require its managers to shunt any excess supply or demand for its shares directly into physical gold bullion. That equalizes differential buying and selling pressure between this ETF and its underlying metal, which is the only way GLD can continue to mirror gold. This first chart shows GLD’s daily physical-gold-bullion holdings superimposed over gold’s price during the past 4 years or so. For each calendar quarter, the builds and draws in GLD’s holdings are noted in both percentage and absolute-tonnage terms. Gold’s price change for each quarter is also shown. The situation in GLD’s holdings today combined with some major events underway or coming argues for big buying. Gold cratered in early 2013 due to an epic record mass exodus from GLD shares by stock investors. In response to stock markets levitated by the Fed’s unprecedented open-ended third quantitative-easing campaign, capital fled alternative investments. Why own anything but stocks when they do nothing but rally thanks to extreme central-bank easing? The resulting extreme GLD-share selling crushed gold. GLD’s mission is to track the gold price, but its shares have their own unique supply and demand that is independent from gold’s. So when stock traders sell GLD shares faster than gold is being sold, this ETF’s price threatens to decouple to the downside. GLD’s managers have to buy back enough GLD shares to sop up the excess supply. They raise the funds to do this by selling off some of this ETF’s underlying gold bullion. The stock-levitation-fueled GLD liquidation finally climaxed in mid-December 2015, the day after the Fed’s first rate hike in 9.5 years. Stock investors and futures speculators alike had come to believe that Fed rate hikes were gold’s ultimate nemesis, despite the fact history proves that gold thrives in Fed-rate-hike cycles! So GLD’s holdings were battered to an extreme 7.3-year secular low of just 630.2 metric tons. With gold itself falling to a 6.1-year secular low that very day, bearish calls abounded for gold to keep on spiraling lower indefinitely. But the combination of gold not collapsing in the face of rate hikes despite the script, and stock markets suffering their worst selloff in 4.4 years in early 2016, led investors to return to gold. So they started migrating capital back into forsaken gold, primarily through buying GLD shares. The differential demand for GLD’s shares was so great during Q1’16 that its holdings surged by 27.5% or 176.9t! That raw tonnage number is important because it once again reveals GLD’s overwhelming influence on gold prices. The World Gold Council’s definitive research on global supply and demand showed overall world gold demand rose 219.4t in Q1. So GLD buying alone accounted for 80.6% of that! That massive gold investment buying continued in Q2, where intense differential demand for GLD shares drove another major 130.8t build. According to the WGC’s latest Gold Demand Trends report on Q2’16 just released yesterday, total global gold demand climbed 139.8t year-over-year. Thus the GLD gold-bullion buying alone from differential share demand was responsible for a whopping 93.6% of Q2’s total! Love GLD or hate it, this single American gold ETF has been the overwhelmingly-dominant driver of gold’s new bull. Stock-market capital flowing into GLD shares certainly hasn’t been the only source of gold investment demand, but so far it’s been the only one that really matters. Global physical bar-and-coin demand per the WGC only rose 1.7t YoY in Q1 and 2.5t in Q2. GLD is the whole gold game this year! Gold stocks’ powerful young bull market was fueled by gold’s own new bull, which in turn was driven by heavy differential demand for GLD shares by American stock investors. And that trend is continuing in Q3, despite it straddling the summer doldrums which are gold’s weakest time of the year seasonally. As of this week, GLD’s holdings are already up 22.6t quarter-to-date in Q3. That’s strong for the summer. And I suspect that investment demand for gold via GLD is on the verge of accelerating markedly again. If stock-market capital resumes flowing into GLD shares, gold is going to be driven higher. 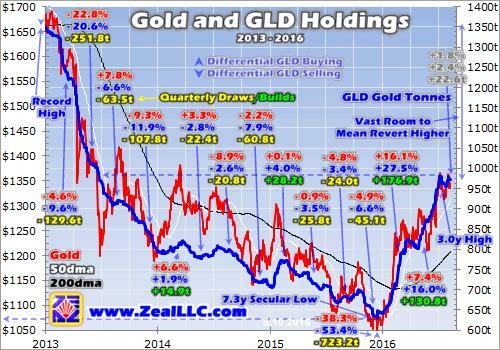 When GLD sees outsized demand for its shares beyond gold’s own, they threaten to decouple to the upside. So GLD’s managers have to offset this excess demand by issuing new shares. The proceeds buy physical gold bullion. Naturally higher gold prices will be amplified by much-higher gold-mining profitability, enticing investors into gold stocks as well. So if stock-market capital indeed starts chasing GLD again in a major way like the massive buying witnessed earlier this year, gold stocks’ next major upleg will really accelerate higher. Several factors are converging now that ought to fuel surging GLD demand in the coming months. The key to it all remains today’s lofty Fed-levitated stock markets. The flagship S&P 500 stock index just hit a series of new all-time record highs in the past month, leading to epic complacency. But with all 500 component stocks trading at an extreme near-bubble simple-average trailing-twelve-month price-to-earnings ratio of 27.2x, these stock markets are an accident waiting to happen. A major selloff is long overdue! When these super-overvalued hyper-complacent stock markets inevitably roll over, gold is going to catch a major bid again just like it did in early 2016. Gold is the ultimate portfolio-diversifying asset since it tends to move counter to stock markets. When stock markets start falling, investors flock to gold because its gains help offset the losses in the rest of their portfolios. Weaker stocks ignite gold investment demand. This coming stock-market selloff dovetails into another key factor that should contribute to strong gold demand for the rest of this year. Because these central-bank-levitated stock markets have radically disconnected from underlying economic reality, most hedge funds are really underperforming so far in 2016. They need to earn some big gains before year-end to catch back up and keep their investors happy. Professional money managers search for fast gains where they’re already happening, attempting to ride the momentum. And this new gold bull is momentum’s epicenter this year! As of the middle of this week, gold and that leading HUI gold-stock index are up 27.0% and 153.3% year-to-date compared to a mere 6.4% YTD gain in the S&P 500! Gold is exceedingly attractive for underperforming fund managers. The guys running these hedge funds are super-smart, and have extensive knowledges of market cycles and history. Thus they know that both gold and gold stocks are now entering their seasonally-strongest times of the year, where mighty autumn rallies power higher. Late summer is the best time of the year seasonally to buy gold, as it tends to enjoy big gains between here and February during bull-market years. Two more factors on top of these could really supercharge this year’s usual outsized autumn surge in gold investment demand. The first is waning confidence in global central banks’ abilities to manipulate stock markets higher indefinitely. Global zero-interest-rate policies are giving way to negative-interest-rate policies, which have even more-destructive side effects. Central banks are running out of rate-cutting ammo. While they can conjure new money out of thin air to monetize bonds through quantitative easing, they are running out of bonds to buy. Central banks have had to extend their QE past the usual government bonds into corporate bonds. And there is even growing talk of helicopter money, the hyper-inflationary extreme where freshly-created new money is given directly to citizens to spend! Central banks’ end game nears. If central banks can’t keep convincing world stock traders that there is always more easing coming, these global stock markets artificially levitated by central-bank easing are in a world of hurt. And all this epic money printing has created epic monetary inflation, which is super-bullish for gold. In the US alone, the Fed’s broad MZM money supply has soared 37.0% higher since gold’s last secular peak of $1894 in August 2011! The other unique factor in 2016 is the great uncertainty this year’s presidential election will spawn. At this point traders are convinced the establishment’s Hillary Clinton will win, and maintain the status quo of easy money. But when Trump inevitably starts rising again in the polls in the coming months, there is going to be serious unease about what this anti-establishment change agent will mean for the markets. Naturally market anxiety is very bullish for gold investment demand, since this metal thrives in times of uncertainty. So there’s plenty of reason to expect this autumn’s gold buying to prove exceptional even after this year’s powerful new bull market. And if gold indeed heads higher as it certainly ought to, it is going to fuel further big gains in gold-stock prices. Their young bull market is ready for its next major upleg. This final chart looks at gold-stock price levels relative to the primary driver of their profits and hence stock prices, gold. 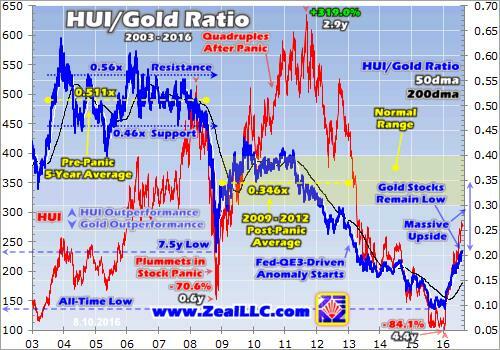 The HUI/Gold Ratio distills down this crucial fundamental relationship into a simple proxy. Dividing the daily close in the HUI gold-stock index by the daily close in gold and charting the result over time shows when gold-stock prices are relatively high or low compared to their fundamental driver. The HGR fell to an all-time low back in mid-January, with gold stocks never being cheaper relative to the metal which drives their profits! This extreme anomaly was fundamentally-absurd, the gold stocks could not trade as if gold was in the low $300s when it was actually near $1100 forever. So the very day of that insane low, I bought and recommended 6 new gold-stock and silver-stock positions in our weekly newsletter. As of this week, they had unrealized gains running as high as +634%! Understanding the relationship between gold prices and gold-stock price levels has already proven immensely profitable in this young new bull. And today’s HUI/Gold Ratio shows gold stocks still remain very low relative to prevailing gold prices now, let alone where gold is heading in its own major new bull. This is super-bullish for gold stocks. Before 2008’s stock panic, the 5-year secular average HGR ran 0.511x. The HUI close meandered in a tight trading range averaging around half of where gold’s price was running. The epic fear maelstrom of that first stock panic in a century in late 2008 shattered gold stocks’ strong relationship with gold, since they fell far faster than gold as investors fled the markets in terror. The resulting 7.5-year HGR low was short-lived. Investors flooded back into the super-undervalued gold stocks in a major way, so they rocketed up out of their extreme stock-panic lows far faster than gold did. In that panic’s aftermath, a new HGR range started to form. Between 2009 and 2012, the HGR averaged 0.346x. That time span is important, as it was the last normal years between the panic and the Fed’s full QE3 ramp starting to levitate stocks in early 2013. Merely mean reverting to that post-panic-average HGR at today’s $1350 gold price would catapult the HUI up to 467! That’s another 66% above current levels, showing the massive upside potential still remaining in gold stocks despite their amazing gains so far this year. That alone ought to be plenty of reason to expect a major new gold-stock upleg. This devastated sector hasn’t even mean reverted to normal yet. But gold stocks’ bull-market potential from here is a heck of a lot higher than a simple mean reversion suggests. Mean reversions out of extremes usually overshoot proportionally to the opposite extreme before they normalize, and gold itself is due to power much higher on heavy investment demand. Plug these numbers into this HGR proxy, and it’s clear investors should be rushing to deploy capital in gold stocks. Back in mid-January at gold stocks’ fundamentally-absurd 13.5-year secular low, the HGR fell to an all-time low of 0.093x. That extreme is a gargantuan 0.253x away from the normal-year post-panic average of 0.346x. Since mean reversions tend to overshoot proportionally to the opposite side out of extremes, we can add that deviation to the HGR average to get an overshoot upside target. It’s an equally-extreme 0.599x! Such extreme HUI levels would be short-lived, only coming late in a major bull where extreme greed for gold stocks snowballed into a popular mania. Nevertheless, that’s exactly how gold-stock bull markets typically end. At today’s $1350 gold, a proportional-overshoot 0.599x HGR implies a HUI of 809. That’s another 187% higher from this week’s levels! And that HGR is still fairly conservative for a bull climax. Back in the mid-2000s, the HGR traded above 0.599x multiple times even within a normal bull market without a popular mania. And given the extreme central-bank-levitated stock markets and vast money printing of recent years, it wouldn’t be surprising at all to see gold stocks reestablish their old pre-panic trading range with gold. From there a proportional HGR overshoot to cap a new secular bull would be far higher. Gold’s own new bull is far from over too, with massive new investment demand still to come. The stock-market investors in particular, the guys who choose to own gold via GLD shares, remain radically-underinvested in gold. They have vast buying left to do merely to get 1% gold exposure in their stock-heavy portfolios at risk of a serious selloff, let alone the 5% to 20% that’s been considered prudent for centuries. Gold’s old secular-bull peak near $1900 should easily be shattered in this new bull, given the extremes in stock markets and money printing courtesy of the easy central banks. But even in 2012 before the Fed’s open-ended QE3 artificially extended a long-in-the-tooth stock bull due to roll over back then, the gold price still averaged a much-higher $1669. Regaining pre-QE3 levels is a very-conservative gold target. At $1669 gold and that 0.346x post-panic-average HGR, that yields a HUI target of 577 which is another 105% higher from here. And at $1669 gold and a proportional-overshoot 0.599x HGR, that actually soars to 1000 or another 255% higher from here! I would be shocked if we don’t see HUI 1000 before gold stocks’ young new bull market fully runs its course. It has barely begun, with the best gains left to come. As always investors and speculators can play the coming gold-stock gains in that leading GDX VanEck Vectors Gold Miners ETF, which closely mirrors the HUI. But GDX is over-diversified so its ultimate gains will be dwarfed by those of the individual gold miners’ stocks with superior fundamentals. A carefully-handpicked portfolio of the best gold miners and explorers will greatly outperform the gold-stock benchmarks. At Zeal we’ve spent literally tens of thousands of hours researching individual gold stocks and markets, so we can better decide what to trade and when. This has resulted in 833 stock trades recommended in real-time for our newsletter subscribers since 2001. Their average annualized realized gains including all losers are running way up at +17.6%! And that’s not including the huge unrealized gains on our books today. They’re running as high as 600%+ this week, with many doubles, triples, and quadruples this year alone! We’re also starting a major new gold-stock and silver-stock deployment to ride this coming upleg. You can read about our new trades and market timing in our acclaimed weekly and monthly newsletters. They draw on our vast experience, knowledge, wisdom, and ongoing research to explain what’s going on in the markets, why, and how to trade them with specific stocks. Subscribe today! For just $10 an issue, you can learn to think, trade, and thrive like a contrarian. The bottom line is heavy gold investment buying is going to fuel gold stocks’ next upleg. Gold is on the verge of seeing major new capital inflows heading into its strong autumn buying season. There’s not only radical underinvestment in this ultimate portfolio diversifier, but lofty overvalued stock markets are overdue to roll over. That will combine with this year’s waning faith in central banks and election uncertainty. Gold stocks are ready to surge again as investment demand drives gold prices higher. The gold miners’ inherent profits leverage really amplifies gold’s gains, and higher profits entice in more investors leading to higher stock prices. And despite their powerful new bull this year, the gold stocks remain low and undervalued relative to gold even at today’s prevailing levels. So their upside potential from here is still vast.